I knew this sandwich was good when my husband and I had it twice in one day: once at lunch and then again at dinner because “I quite fancy another one of those”. In my mind, I could eat this tasty sandwich for the rest of my life. Salty bacon (drool), creamy brie (double drool), and the sweetness of the roasted red pepper drizzled in balsamic vinegar (puddle of drool). Put it in between two slices of your favorite bread and you’ve got it made. Preheat oven to the highest temperature. Wash and clean red bell peppers. Place in the oven and let cook until skin is blistering. Make sure to turn it over so that all sides are equally blistered. When equally charred on all sides, place in a lidded container. Seal it and let steam until cool. When cool enough to the touch, peel off skin and remove seeds from inside. Cut into strips about 1 in / 2 cm thick. Drizzle with 1-2 tsp of balsamic vinegar and season with salt and pepper. 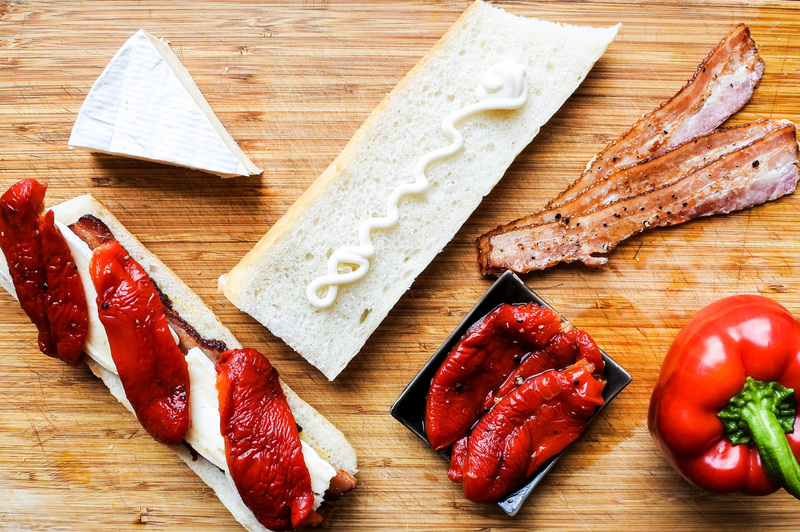 Place sliced red pepper in a baguette along with thick slices of brie, crispy bacon, a drizzle of mayonnaise (optional) and a smear of Dijon mustard (optional). Crisp, salty bacon, creamy brie cheese and roasted red pepper seasoned with balsamic vinegar together in a baguette sandwich. Wash and clean red bell peppers. Place in the oven and let cook until skin is blistering. Make sure to turn it over so that all sides are equally blistered. When equally charred on all sides, place in a lidded container. Seal it and let steam until cool. Cut into strips about 1 in / 2 cm thick. Drizzle with 1-2 tsp of balsamic vinegar and season with salt and pepper.